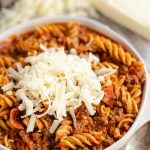 Pressure Cooker Light Pizza Noodle Casserole is an easy 30 minute family friendly dinner recipe made in your Instant Pot. 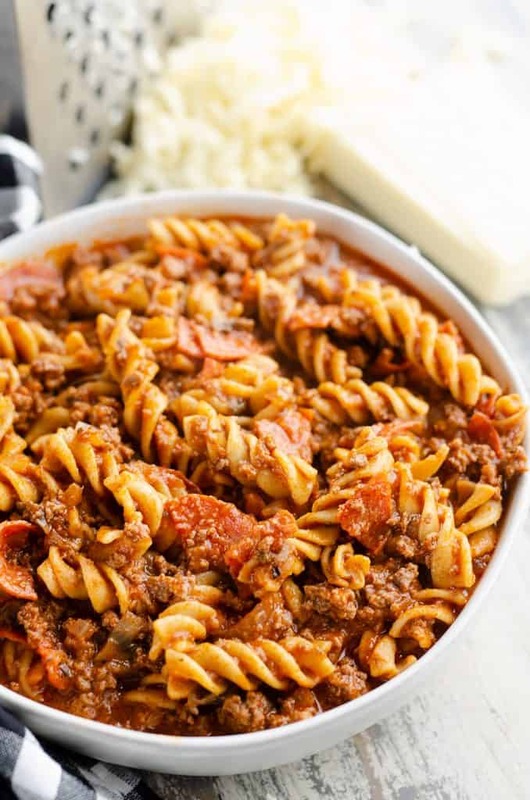 Whole wheat pasta, lean hamburger, turkey pepperoni and pizza sauce combine to make this healthy and comforting meal. Growing up, Pizza Noodle Hotdish was one of my mom’s go-to dinner recipes. It was one of the few hotdishes I actually enjoyed to be honest. I don’t find myself making casseroles all that often anymore, but every now and again I crave some of that good hearty comfort food. 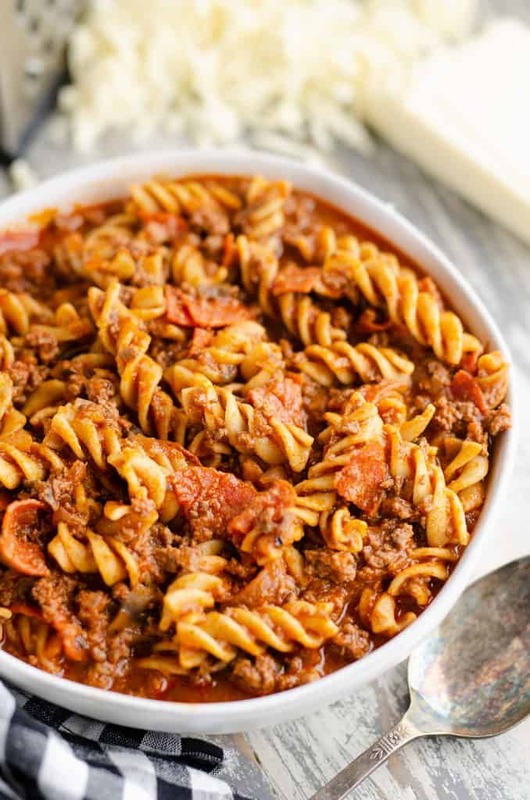 This Pressure Cooker Light Pizza Noodle Casserole is my mom’s great recipe, lightened up with whole wheat pasta and turkey pepperoni and made much quicker and easier with the help of your Instant Pot! 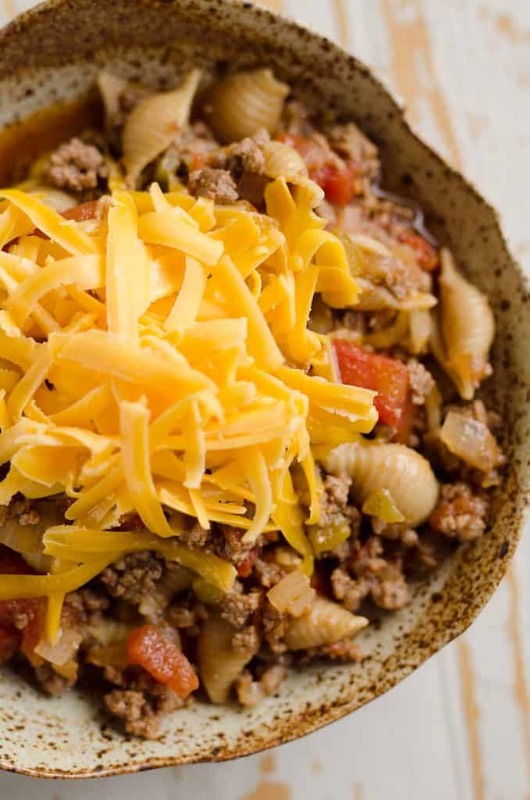 This is the kind of one pot dish that I love for a simple weeknight dinner. Turn your electric pressure cooker to saute and cook hamburger and onion for a few minutes. Add in the spices, turkey pepperoni, pizza sauce, mushrooms and pasta. Be sure to use whole wheat pasta because white pasta will cook faster and be mushy. If you aren’t a big fan of the texture of mushrooms you can skip them, but I recommend chopping them up finely. When they cook up with the hamburger you won’t even notice they are there. Lock the lid in place and cook on high pressure for 4 minutes. Release the pressure from the Instant Pot when the cooking time is up and remove the lid. Allow the pasta to rest for 5 minutes and absorb some more of the liquid. 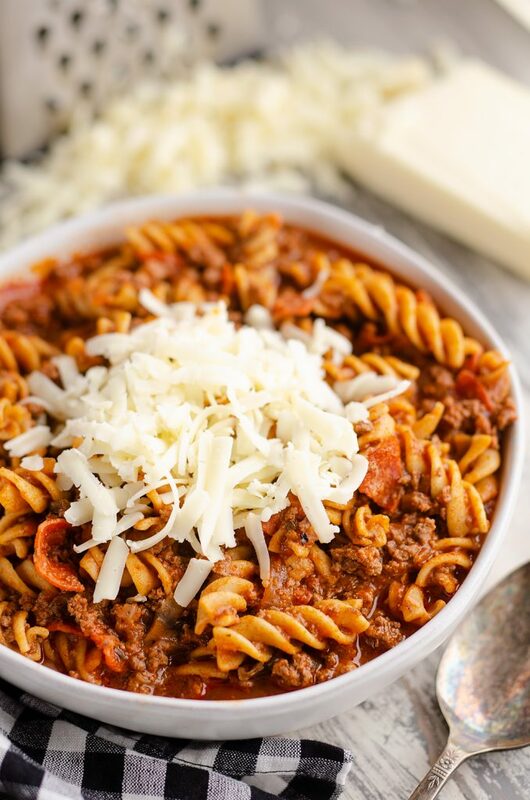 Stir in the Parmesan cheese and you have a delicious dinner ready in less than 30 minutes! 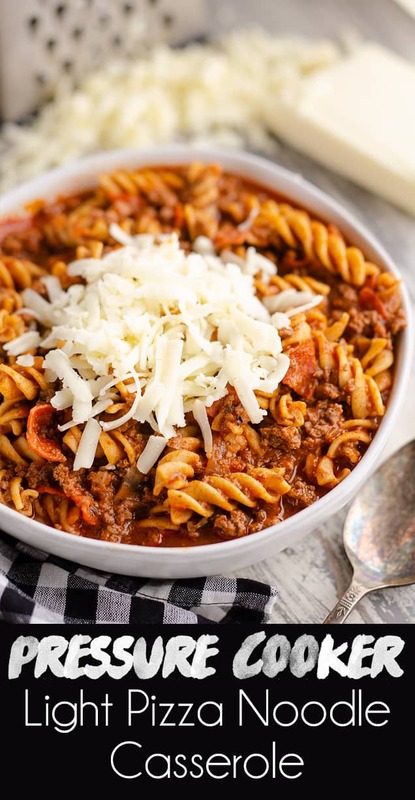 This easy dish is sure to be a hit with the whole family. 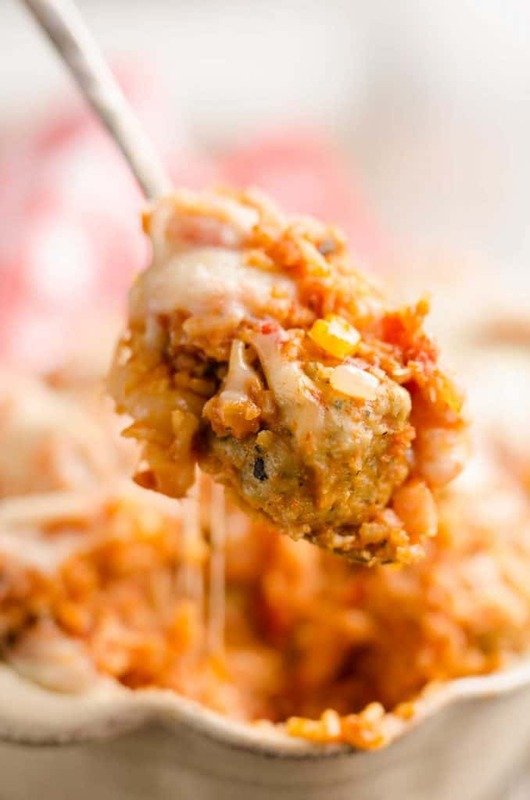 Kids and adults will love all the great flavors of pizza made into an easy casserole recipe. 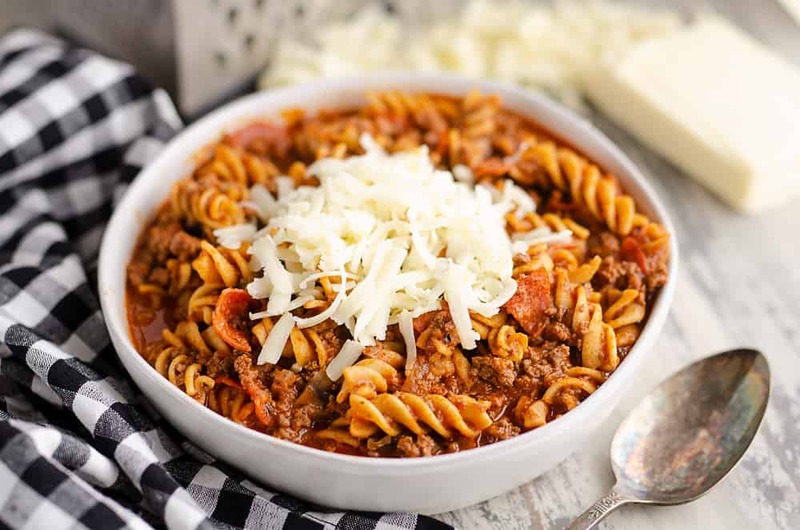 Whether you are looking for a new dish to serve your picky eaters or just need to speed dinner up because life isn’t running on time, this is a must-try dish. Set your 5 or 6 quart electric pressure cooker to saute and add the hamburger and onion. Break up the hamburger and saute for 4-5 minutes so meat is lightly browned. Press cancel. Add the salt, garlic powder, oregano, crushed red pepper, pepperoni, pasta and water to the meat and give it a quick stir. Top with the pizza sauce and do NOT stir. Lock the electric pressure cooker lid in place and manually set to 4 minutes on high. Press start. When the time is up, quick release the pressure using an oven mitten to release the pressure nozzle. Allow to cool for 5 minutes and stir in the grated Parmesan cheese. Serve topped with shredded cheese. Can’t to make this for my grandkids they will love it! My kids love pizza casserole and I love the fact that I can make it in my IP now!! This is truly a family favorite of ours and I love how you have lightened it up!! I didn’t even know turkey pepperoni was a thing! This opens up a whole new world!